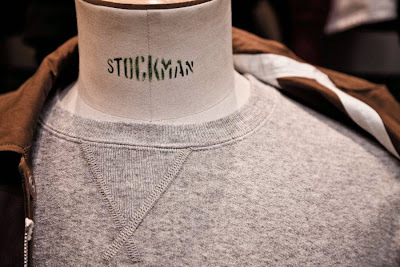 I don’t know much about casual clothing – I’ll leave trainers and denim to other geeks – but the craft at Albam has a lot in common with bespoke tailoring. It’s all about individuality, as with that stitching, and craft and value. Coats, T-shirts and knitwear are made the old-fashioned way because there is a belief that it is better – it lasts longer, it wears better and it works. I rarely speculate what Permanent Style readers wear at the weekend (indeed part of me hopes they wear full tweed and neckerchiefs). But if it is chinos and sweatshirts, I would hope they are made by a brand with the same attitude to craft as their tailor. Like Albam. James and Albam co-founder Alastair didn’t start making clothes in Britain out of any ethical stance and they refuse to be poster boys for that movement. They were just living in Nottingham and wanted to try and make a T-shirt; so they went to the local factories to see if they could do it. They started with very limited runs, having “spent most of our frighteningly small amount of money on business cards and stationery”. Factories were convinced to make six items, as uneconomic as it might be. 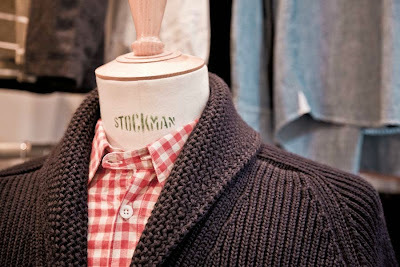 And today shirts are usually only made in runs of 70 in each colour; there will be just 100 of the shawl-collar cardigans across five sizes. What began as necessity is now a nice push for quick sales among loyal customers, anxious not to miss out on new lines. I realised that to my cost a couple of weeks ago, when I popped into the shop and fell in love with the Alpine jacket. Made of Ventile like the new mac (a pure-cotton fabric used by Arctic explorers, as synthetics can freeze and crack), it has taped seams and would have been perfect for cycling into work. But they only had two left, both in big sizes. Fortunately, I did get some great chinos – and here’s another tailoring link. When James and Alastair were coming up with this cut they went to a trouser cutter, not a designer, without any preconceptions of what they should look like. The result is jeans and chinos that fit a lot more like suit trousers, with a higher and darted waist. 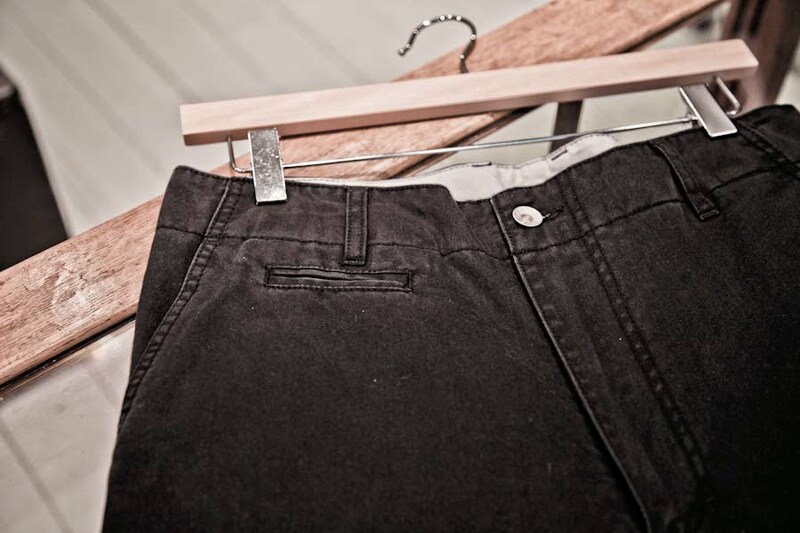 We’re not talking wear-with-braces height, on your belly button, but just an inch higher than normal jeans – making them far more comfortable and yet still narrow and stylish through the leg. 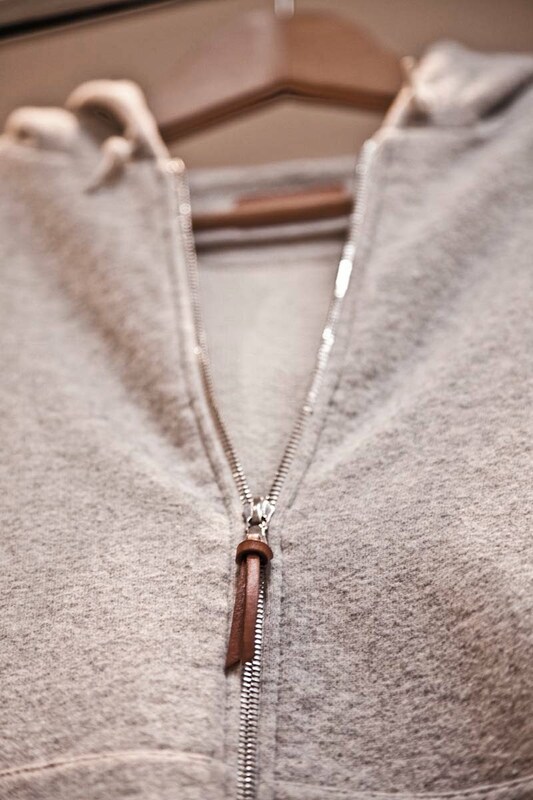 The other great design element is the coin pocket. You know that little pocket normally tucked inside the side pocket on trousers, which is too small and narrow to get anything in, and even if you did get anything in you couldn’t get it out? Well here it’s wider, shallower and an inch below the waistband. You will actually put change in there. Production in England (and shirts finished in Portugal) is obviously more expensive. But materials are the big expense. The fabric most hiking jackets are made out of will cost you £1 or £2 a metre; that Ventile stuff is more like £20. And RiRi zips (see my post on their quality here) will set you back around another £10 each. Suddenly it’s surprising the chinos are only £89. But again, there is little pretense: “I’d like to make clothes that are like Marks & Spencer used to be. When you’d go in wanting a navy cardigan and find exactly what you wanted, well made and well cut, for a decent price,” says James. Every season James and Alastair like to think they improve the clothes they do, gradually but methodically. The piece that first made them famous, a fisherman’s cagoule, has gone through several iterations – adding a better button, then a better thread, later a stronger draw cord, eventually corozo-nut buttons, finally better corozo buttons. They are happy to upgrade items when customers notice theirs have been superseded. “And our customers notice,” says James. Apparently some are just as obsessive about cotton macs I am about welting. New lines drop into Albam all the time. The best place to keep up to date with them is the behind the scenes blog, but look out on Permanent Style for updates as well. Rumour has it they might even be making some of those Alpine jackets again. Here’s typing with crossed fingers. 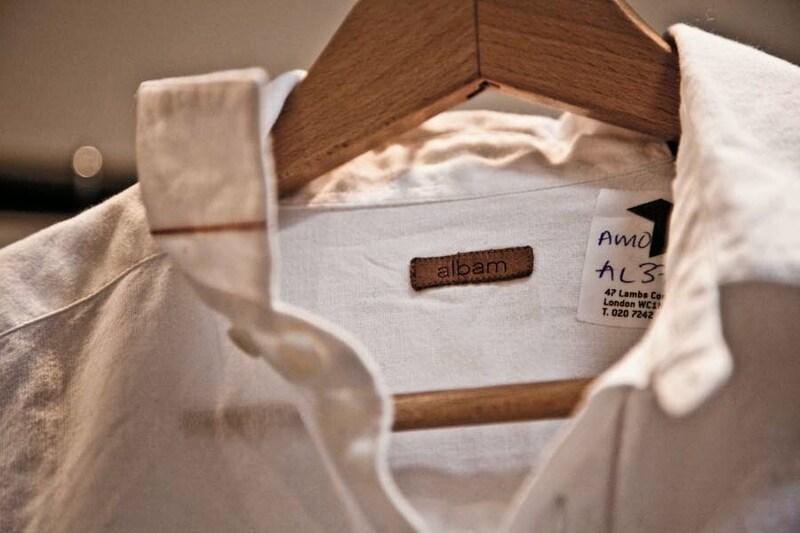 You can follow the discussion on Albam: Craft for the weekend by entering your email address in the box below. You will then receive an email every time a new comment is added. These will also contain a link to a page where you can stop the alerts, and remove all of your related data from the site. 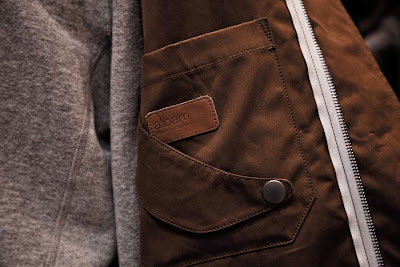 Albam is one of my favorite brands ever, they are everything people say APC is, but better. Every item I’ve gotten there I’ve loved and wear all the time. Their spring chinos are probably my favorite so far: they fit perfectly and the fabric breathes incredibly well, I have worn them almost everyday this past summer in sweltering mid-Atlantic heat (hovering around 95-100 degrees F or 35-38 C for most of July into August) and never felt uncomfortable. My only complaint was they only had a single back pocket, a feature which made me hesitant to purchase a second pair in grey. In retrospect, that was a stupid mistake. How rare to be made so excited about craft in casual clothing. I am an Albam convert! Good piece on Albam! Best quality I’ve owned, and good, fair price. This is a very good business.